Now for the part most are probably waiting for... what's new with SharePoint Server 2010 Web Content Management! I'll touch on just a few things in this post... obviously you can leverage a ton of the new stuff in SharePoint that's available across the board such as Silverlight, leveraging the ribbon, and so much more. This tool has two purposes. First, there are those of you who have large page libraries with hundreds or thousands of pages in a single library. The content organizer will help you with those and make sure you can keep things a bit cleaner and... well... more organized. The other goal of this tool is to help content authors with the question it seems everyone has: "where does this go on the site?" Sometimes that question isn't so straight forward... this will help with that as well. The content organizer is actually very straightforward. What you do is setup a few rules on a Publishing site and when new content is saved / published, if it meets the criteria of one of the rules, the content will be automatically moved to the location you specify. A common request we had in the previous was the ability to add ratings to pages. Now it's as easy as enabling the Ratings Feature (a hidden Feature... no clue as to why you'd want to hide this capability!). There's a new site column you can add to your content types and associated field control to let readers of your page vote on a scale of 1-5. These ratings are then processed (in a background job) and shown as the commonly seen filled in stars. 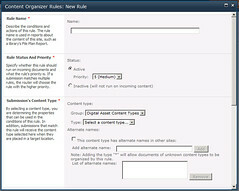 A huge focus in SharePoint Server 2010 is the emphasis on metadata. There is a new Metadata Manager service application that enables administrators to define and manage taxonomies. I'll dig into this capability quite a bit more in a future blog post. What's cool about this though is that you can now add a new column that's based on the field type called Managed Metadata to your content types. Then your content owners can tag up a page which you can then leverage in search solutions, navigation solutions or any way you like as Microsoft ships a huge taxonomy API in the Microsoft.SharePoint.Taxonomy.dll assembly. The thing I like most about this is how it really helps SharePoint compete on a certain level with other WCM offerings by the competition. One challenge I've had with SharePoint's implementation of WCM is that it's all basically folder based (thinking of SPWebs and SPSites as bigger folders). Many competitors take a different approach where they throw the content in a big bucket and tag the hell out of it. With this metadata addition to the SharePoint platform, we can have the best of both worlds! Replacing the usage analysis in the previous version of SharePoint, the new Web Analytics service application will give you a good overview of what your site looks like from the perspective of most hit pages, size and other things like that. Note that this isn't some massive analytics package where you can do a ton of trending analysis of the paths people are taking through your site, but you can setup some alerts and use some included Web Parts like that will show your users the most popular pages in the site. Video has quickly become a very important piece of managed content sites. There's a lot more support OOTB in SharePoint Server 2010 for video and rich media including a skinnable Silverlight player and various storage options. 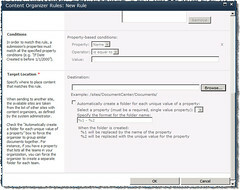 That's just a few of the new things we have in SharePoint Server 2010 Web Content Management. I didn't touch on everything, but just a few things. Looking forward to blogging more on WCM in the future!